I’m going to guess that the Crack is Bottlehead’s all time most popular kit. A great little tube headphone amplifier at a price-point nearly anyone can afford that sounds very good for the money, it’s really hard to go wrong here. The Crack has gone up in price a little bit since its introduction 3+ years ago, but it’s still quite a value. I also highly recommend the Speedball upgrade, which replaces the plate loads on the tubes with a constant current source and brings this amp into its own with added detail and transparency. I built a Crack shortly after its release and of course replaced a number of the parts with racier versions and it sounded quite good. Years later, I reminisced how much fun it was to put together that point-to-point Crack and decided to build a new one from the ground up with fancy parts and give it a layout that would accept that added girth. While I normally would have turned to Keith Kirby to shape me up a new chassis, it was time for me to step up and build my own, despite not being crazy about working with wood. 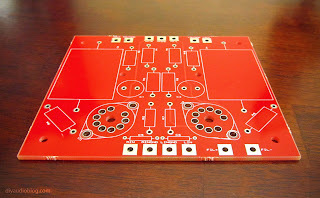 The first task was to figure out what the size of the top plate would be with the additional room for larger capacitors (in both coupling and power supply positions) and a pair of large-ish Hammond chokes for the power supply as well. This ended up being 12” x 12” (more than twice the stock 10x6 size! 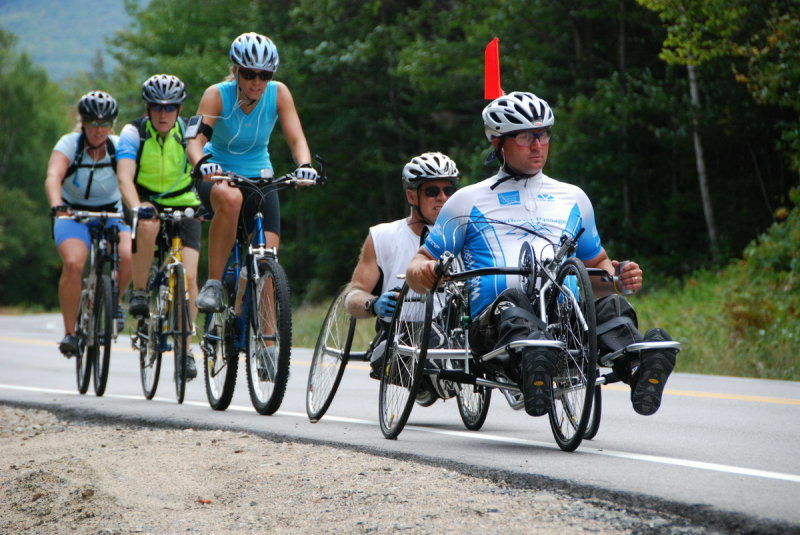 ), which is perfect as sheets of metal can be ordered in 12” x 12”. 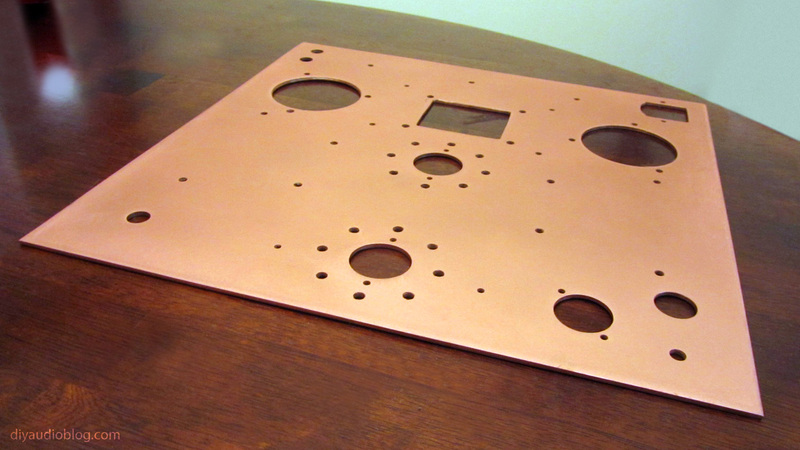 Rather than go with the typical aluminum plate, I spent a few extra bucks and went with a 12” x 12” x 0.1” copper plate. 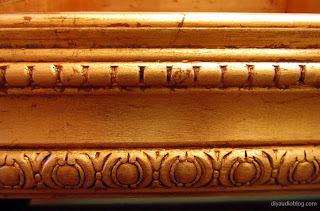 The copper provides even better grounding and conduction than aluminum and comes with a nice natural color. 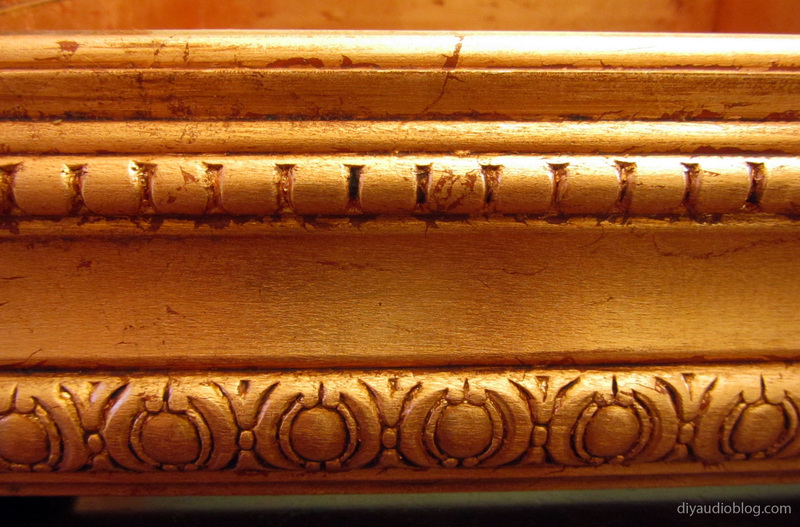 Despite the fluctuating metal market, a copper plate this size isn't too bad at about $40. The next chassis-related task was to create the wooden box that the plate would sit on top of. This is not the most trivial of tasks for those of us not blessed with nice power tools and a garage. So, I drew up the dimensions of the plate, where the plate would sit on top of the routed edges on the wood, noted how deep the route would be, and based on that drawing I found the appropriate sizes for the wood to be cut and added about a 1/16” of an inch for wiggle room. For the wood itself, I decided I wanted something a little more intricate (“fussy”, as someone I know would call it) than flat sides, so I went with a flat piece of pine and a piece of decorative molding and glued the two together. I then used the router to make a decorative route along the outer top edge and used a rabbeting bit to make the inner route that the plate would sit on. 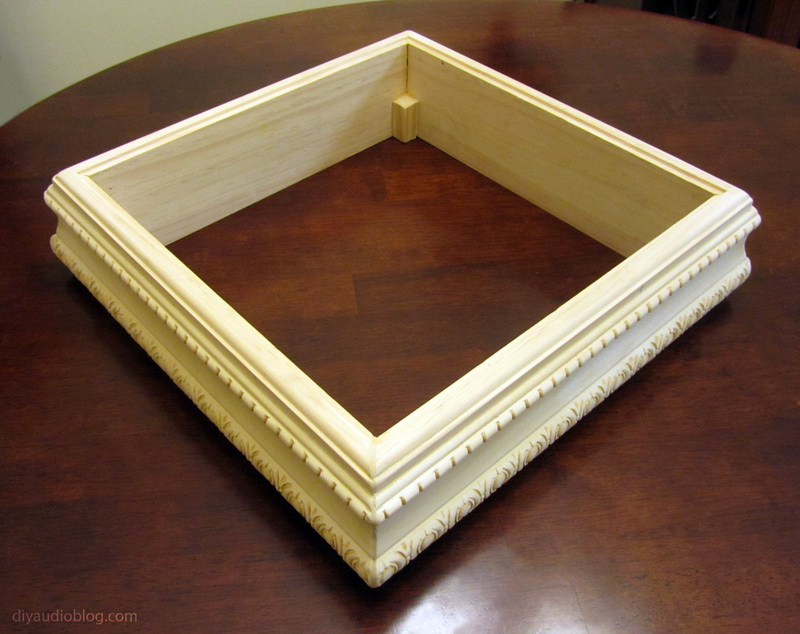 Four sections of this piece could then be cut at 45 degree angles to make the box. Since I was cutting the wood by hand, I used a plastic miter box and did my best to cut at a straight 45 degrees all the way down to get the corners to line up properly. Obviously, this never works out perfectly, so that’s what wood filler is for. 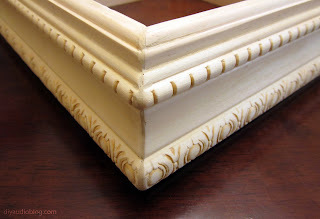 Once the box was assembled with wood glue and the wood filler sanded down smoothly, four small wood blocks were glued to the bottom corners to provide adequate surface area for the EAR damping feet to be placed. 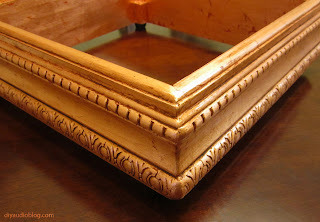 For the finish, rather than simply staining the wood like I normally would, I opted to use a copper leafing kit from Old World Art to bring the copper theme into the base. The leafing kit is a multi-step process including a red base coat, adhesive size layer, application and burnishing of the metal leaf, a sealer coat, application of an antique top-coat, and then another sealer coat. 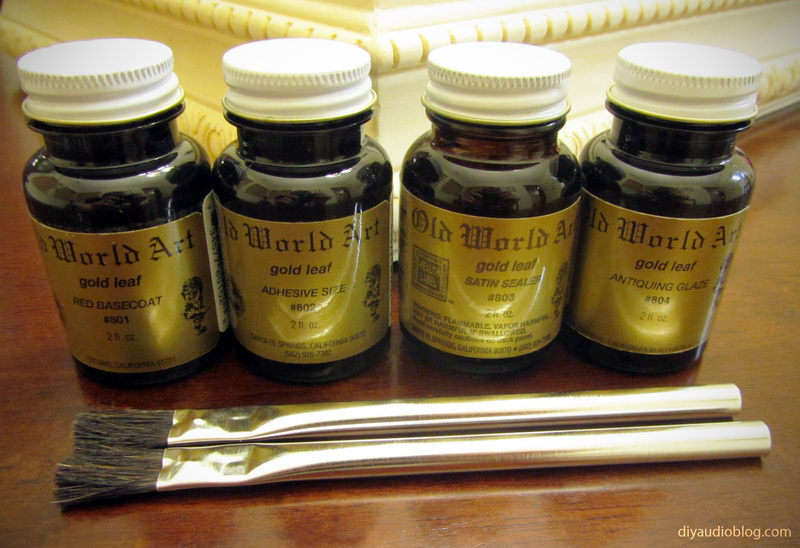 The nice thing about copper leaf is it's incredibly cheap; a set of 25 sheets runs less than $10. 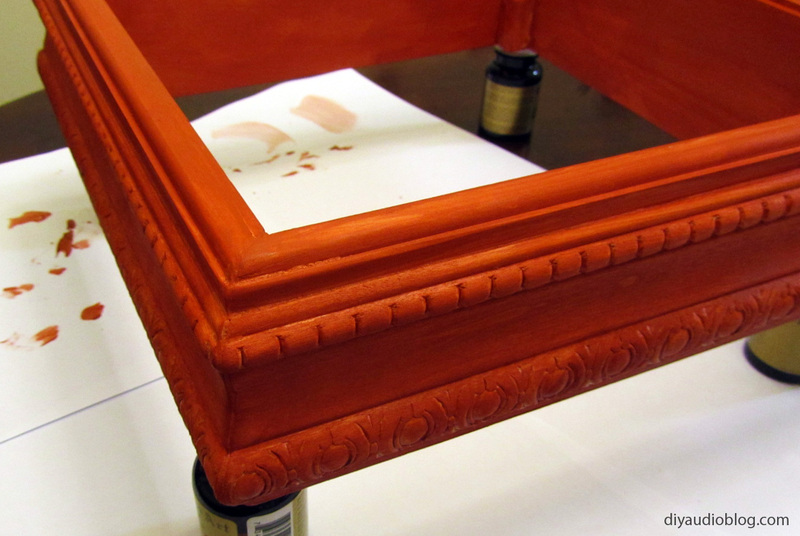 Once complete, it looks like the texture you would find on an old frame on a painting in an art gallery. 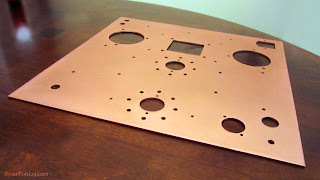 Now the copper plate could be cut, punched, drilled, Dremeled, etc. to hold all the parts in place. The layout used to plan the initial plate size was used to determine where each hole would fall. 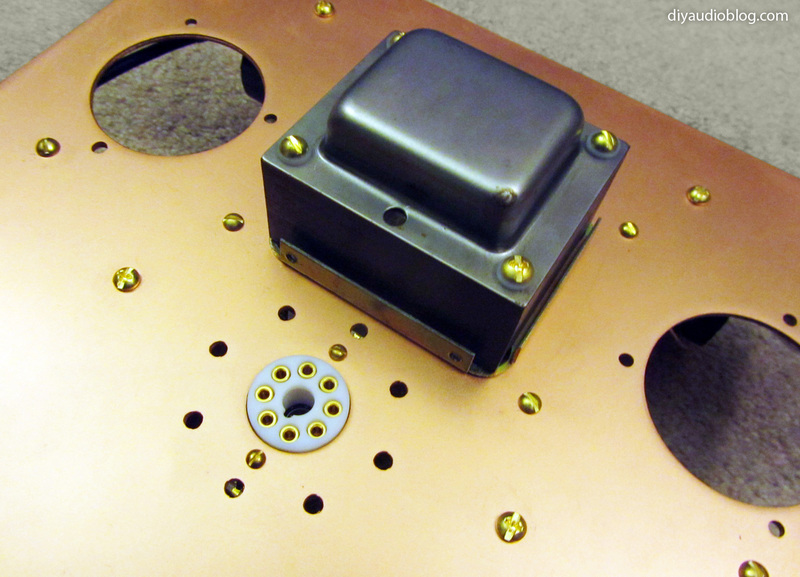 Small holes were drilled using the drill press, larger holes for tubes and the Neutrik locking plug were punched using GreenLee punches, the extra-large holes for the capacitors were cut using hole saws on the drill press, and square holes, like for the transformer and IEC inlet were cut using a Dremel metal cutting disc. 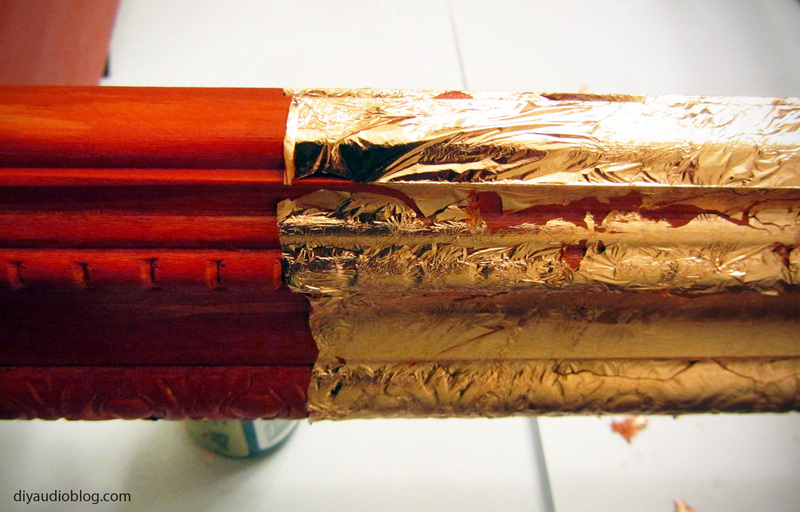 The copper is a little denser than aluminum and requires a bit more effort to cut through. Once the chassis plate had all the holes necessary to accommodate the parts for the build, it was sanded down, starting with 80 grit sandpaper and ending with 600 grit. Next, a coat of clear satin finish was sprayed on each side to protect the copper, otherwise it tends to pick up fingerprints and oxidize. Gloves needed to be used after the sanding process so my fingers wouldn’t leave any oil on the copper. Once the clear coat was dry, parts could finally be fastened onto the plate. Aside from the PT-3 transformer from Bottlehead, a little bit of the wiring, and the Speedball upgrade, all other parts were swapped. 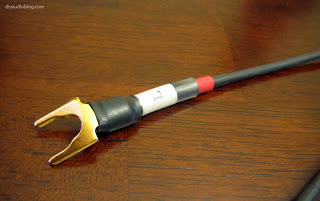 For the wiring, silver plated copper in PTFE/Teflon was used for power connections, including the heaters, Cardas 20.5g internally litzed copper in Teflon for the signal, and Kimber 19 gauge copper in Teflon for capacitor connections, etc. Shielded Cardas copper in Teflon was used for the input and output wiring with the copper mesh shield grounded. 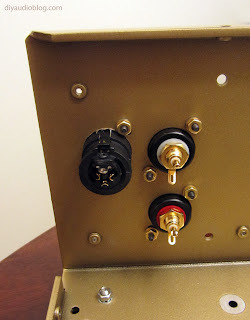 A few of the nice gold plated solder posts from VT4C were used in place of the tin plated ones, and short turret boards were used to handle the power supply connections, which I find a little more robust for multiple connections. The tube sockets were Teflon with gold plated copper contacts and matching miniature PCBs. Coupling caps were a combination of a 47uF Obbligato Gold Premiums and 70uF Obbligato Film in Oils, both good values for the money. The final power supply capacitor was replaced with a set of three 75uF Axon caps wired in parallel (simply because the three together were a bit cheaper than a single 220uF film cap). The volume control was a relatively low-cost Taiwanese ladder stepped attenuator. Resistors were all of the Kiwame / Koa Speers carbon film 2 watt variety. The knob was a solid aluminum one with set screw from Kilo. Finally, the switch was a nice little brass plated 3A DPDT that was made for guitars. Even though the stock Bottlehead PT-3 looks great as-is, I wanted to try something a little different for this build, so I opted to use a transformer cover from VT4C. The transformer cover base had to be trimmed to fit the PT-3, but it's a perfect fit length and width wise. In order to make a nice clean install for the three 75uF film capacitors in the power supply, I fabricated a piece of FRP (fiberglass reinforced plastic) with a few turrets that would sit on top of the caps and accept solder connections so they could be cleanly wired in parallel. The three caps wired in parallel give about 228uF (75x3 plus a little bit of tolerance wiggle room), very close to the 220uF electrolytic they are replacing. After firing up the build in stock configuration and making sure it held smoke. I powered it down, removed the tubes and installed the very worthwhile Speedball upgrade. As mentioned earlier, the Speedball is a constant current source upgrade that replaces the plate loads of the input and power tubes. I also took the time to wire up the big 70uF oil filled Obbligato film caps. 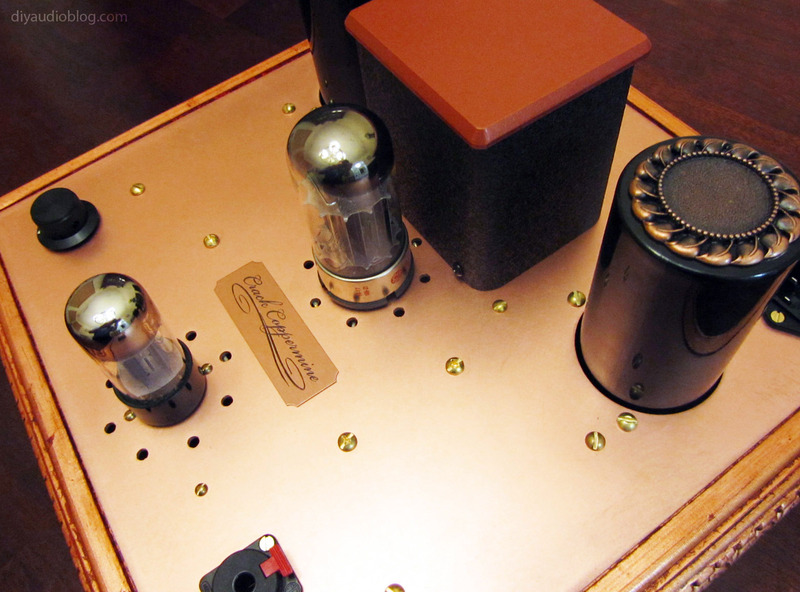 Here's a shot of the completed amplifier sitting on the copper leafed base. I really love the look of the copper color and black on this build. Some nice little embellishments were a custom logo I made for the Coppermine Crack which I had engraved on a 3" wide copper plate, as well as some copper plated earrings which I attached to the top of the oil capacitors. The final product looks and sounds great. I hope you enjoyed this build. As mentioned in previous posts, much of the audiophile world has really moved from compact disc players to a computer-based digital audio setup, whether it's streaming over the local area network or coming directly from the output on your desktop or laptop. 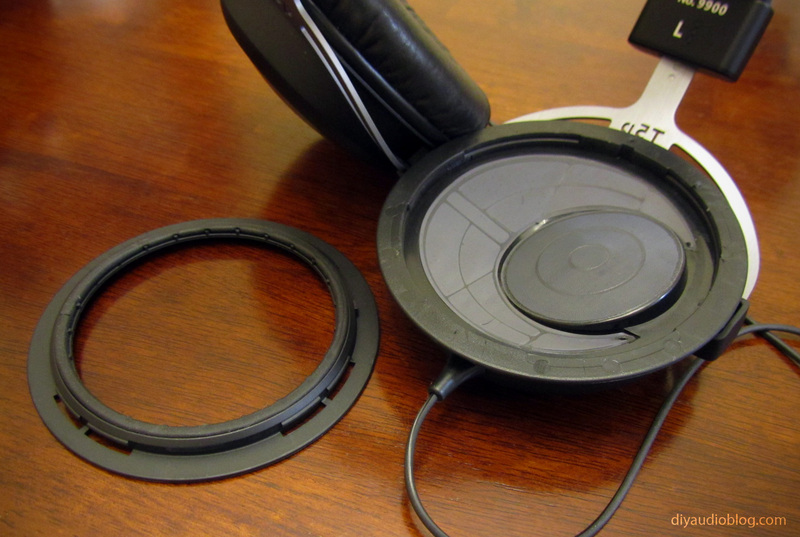 As we all know, the built-in digital audio converter in a computer generally leaves a lot to be desired for an audiophile. The sound card is generally an afterthought built into a computers motherboard with some of the lowest-cost chips available, likely doesn't have a very low noise floor and probably has gimmicky features like 3D sound processing. The best option is to bypass as much of this as possible, either through a dedicated optical output from a reputable sound card (something like the ESI Juli@), or to use a USB to coax converter (there are TONS of these on the market from companies like M2Tech, Musical Fidelity, Stello, etc.) and get that digital signal to a high quality external DAC. An external DAC (digital analog converter) effectively converts a digital binary signal (think 1s and 0s) to an analog signal that you can send to your speaker or headphone amplifier. External DACs started to gain momentum in the late 80s when used with CD players with a digital output. Now with computer audio, there are thousands of DAC offerings on the market. There are non-oversampling (NOS) DACs from makers such as MHDT and Valab, and oversampling DACs (also known as interpolating DACs) which use a pulse density conversion technique, from makers like Benchmark, Lavry and Audio Note Kits. Some feature tubes, some are solid state, some are warm sounding, some are bright or analytical. Really the best thing you can do when selecting a DAC is read a review from someone whose ears you trust (tends to enjoy gear that you enjoy) or preferably test one at an audio meet, as the source really is the cornerstone of your audio system and it's important to get one you really like. 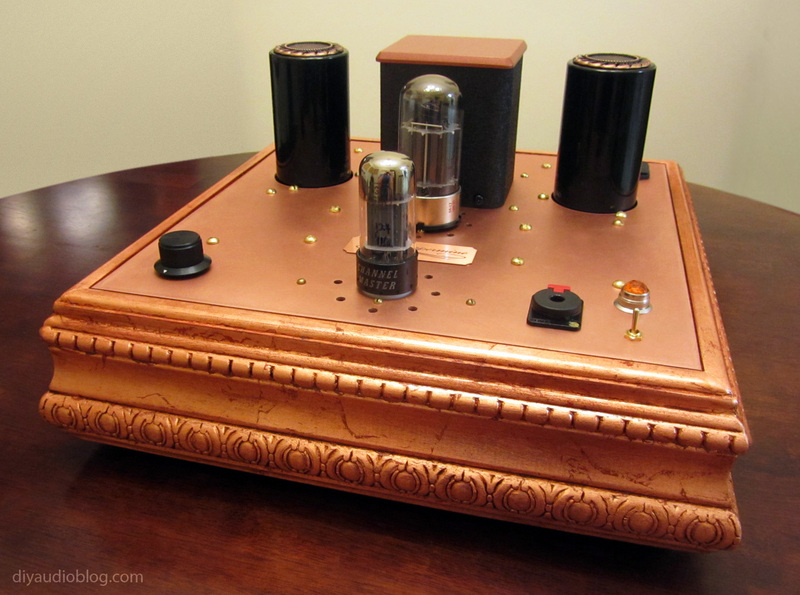 When a warm sound is preferred, often a tube DAC is the best answer; tube-based implementations tend to add harmonics and distortion to the sound that's very pleasant to the ear. 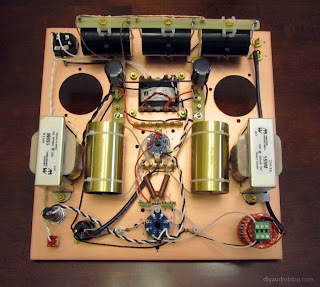 Since this blog is all about DIY, I will be building a tube-based DAC kit. 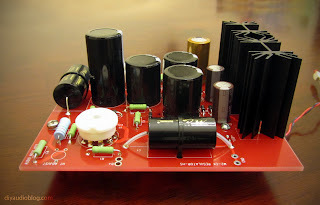 The company Audio Note Kits has been offering tube-based kits online for nearly ten years now and has been around for much longer. 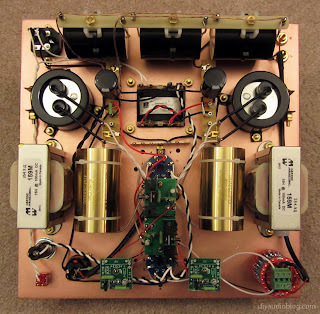 The available number of kits is impressive; there are a number of push-pull amplifiers, single-ended amplifiers, DACs, pre-amplifiers, phono pre-amps and speakers. 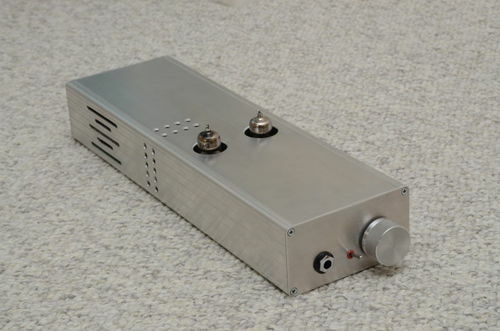 A rather interesting new product is the HiFiMan HE-6 headphone amplifier that runs on EL84s. As of this writing there were over 20 different kits available. The current DAC models are the L2.1, L3.1 and L4.1. Each model is offered in a few different flavors, the standard and signature versions, and there are a few options available balanced transformers and a USB converter. The different versions feature different tubes (6922 in the L2.1, 5687 in the L3.1 and L4.1), different transformer configurations and the parts quality is predictable higher in the more expensive L3.1 and L4.1. The usually rather poor operational amp chips which are fed by the I/V resistor are eliminated. The digital and analogue grounds can be isolated which can remove some complex distortion mechanisms. The unique frequency characteristics of the transformer can provide improved filtering of the quantization noise. The starting block of any build is the chassis. 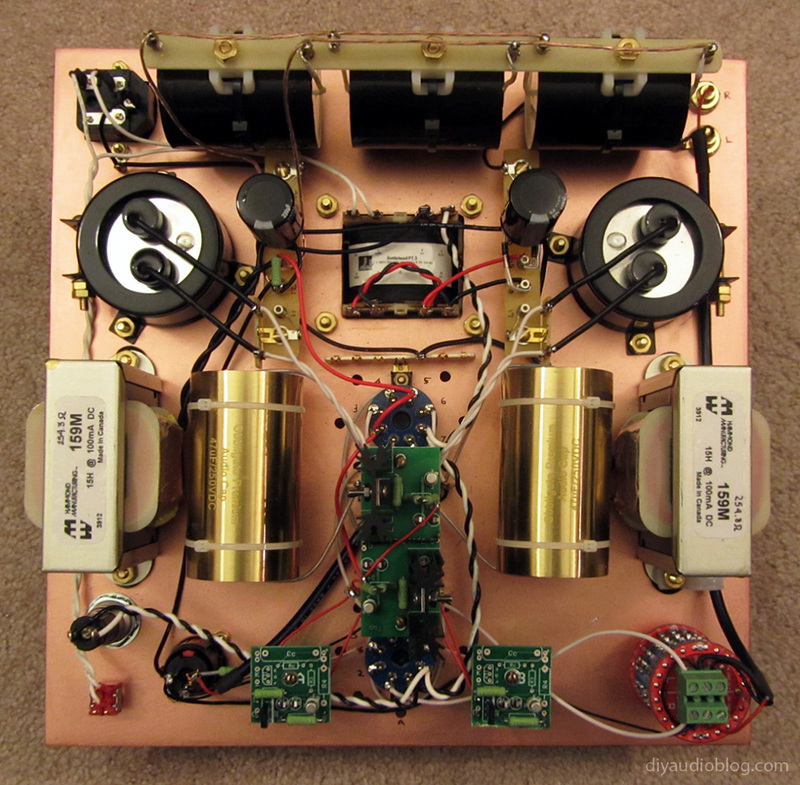 Audio Note Kits had the intelligent idea to create a relatively universal chassis that could be used for many of their builds. Any holes that are unnecessary are covered up by the front and rear plate or are on the bottom where no one can see them. This "universal" chassis is a very thick gauge and is quite heavy, which is necessary to prevent bowing if it's holding a number of bulky transformers. The stock chassis comes in a nice textured black, with black front and rear panels (these appear to be plexiglass or lexan) and screened gold logos and text. 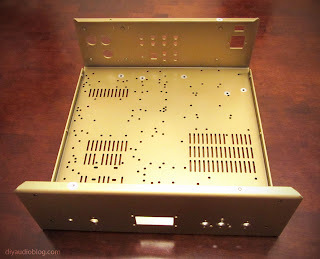 I opted to have the chassis powdercoated gold to match the gold logos and make my unit a little different. 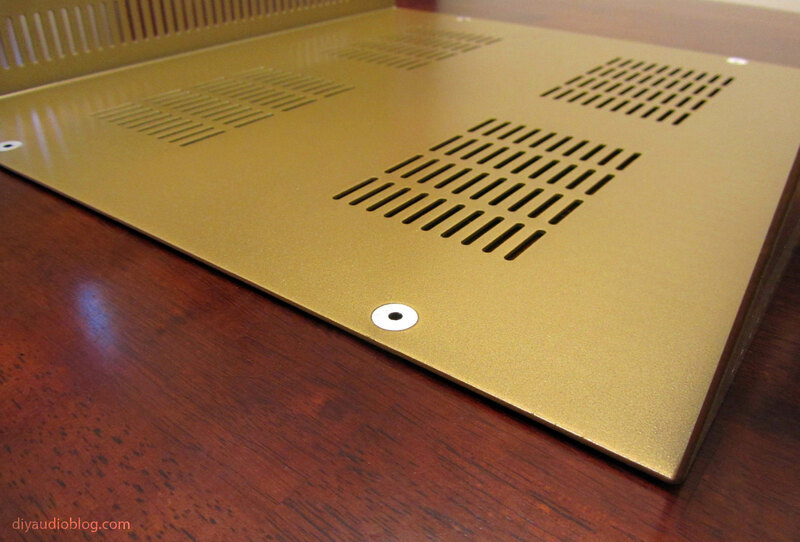 When the unit is powdercoated, it's necessary to leave the exposed metal areas for proper grounding and protect the screw holes so they are still usable after the process. 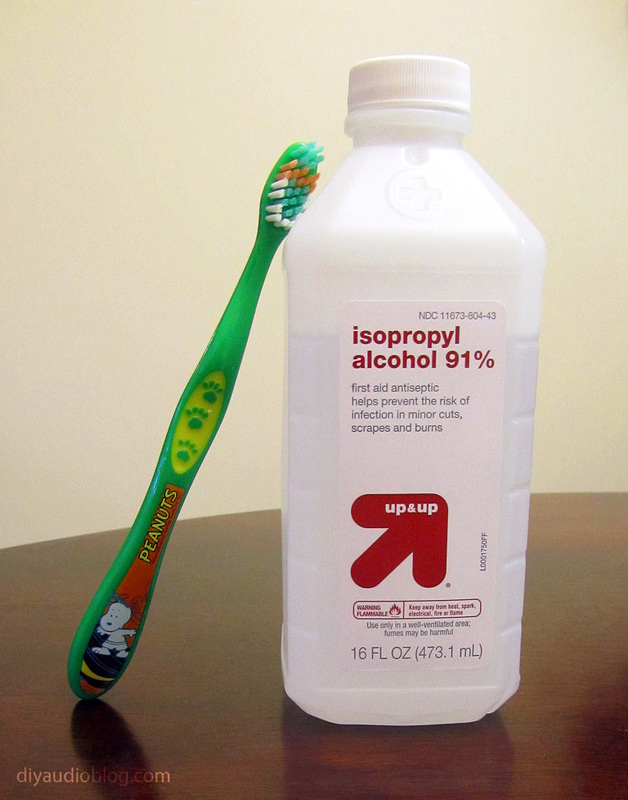 These can be done by using screw hole inserts and stickers that are compatible with the powdercoating process. Below is an example of a chassis hole with exposed metal surrounding it after the gold powdercoat. Concentrating on the chassis inputs and outputs, it was already decided that the chassis would use a balanced AES-EBU digital input in one of the D-flange holes. 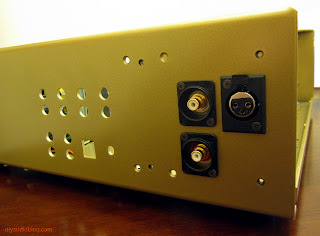 To make use of the other two D-Flange holes, I'll be using a pair of Neutrik recessed RCAs for the analog output of the DAC. 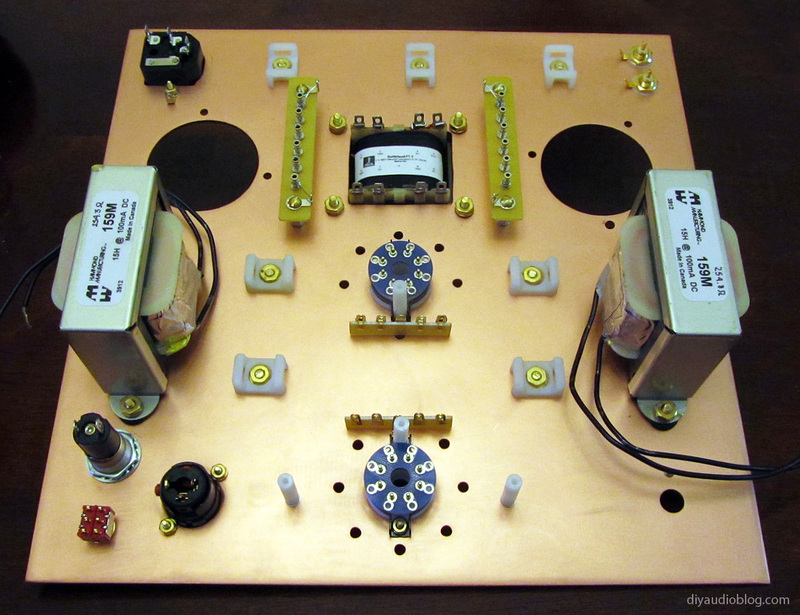 The RCAs themselves would be replaced with the higher quality copper body Vampire RCA jacks (as seen in lower right). Also used is a Vampire XLR-CF jack with gold plated copper alloy contacts for the AES / EBU digital input. Do note that the holes on the chassis need to be enlarged a bit for these items. 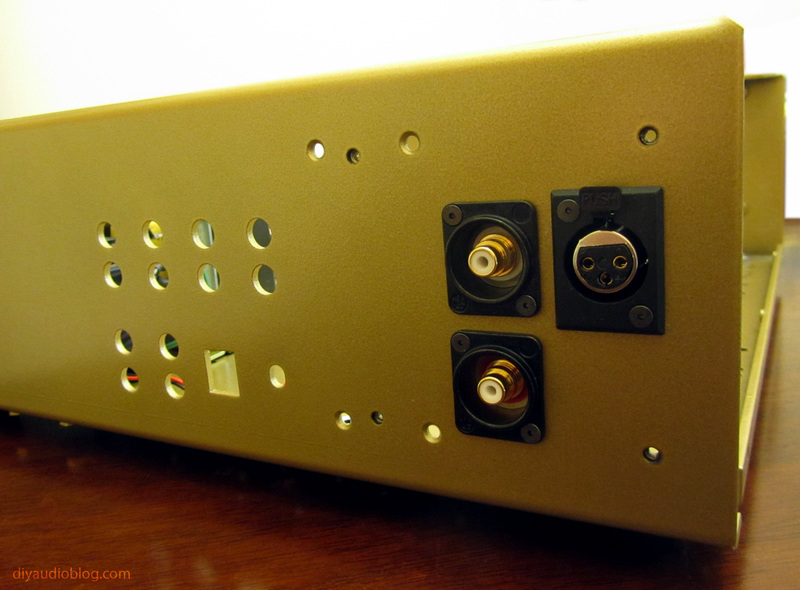 Next, the power switch and power inlet could be installed on the back panel of the chassis. I opted to upgrade to a Furutech IEC inlet FI-103(G) with built-in fuse holder which has some nice gold-plated copper alloy conductors. 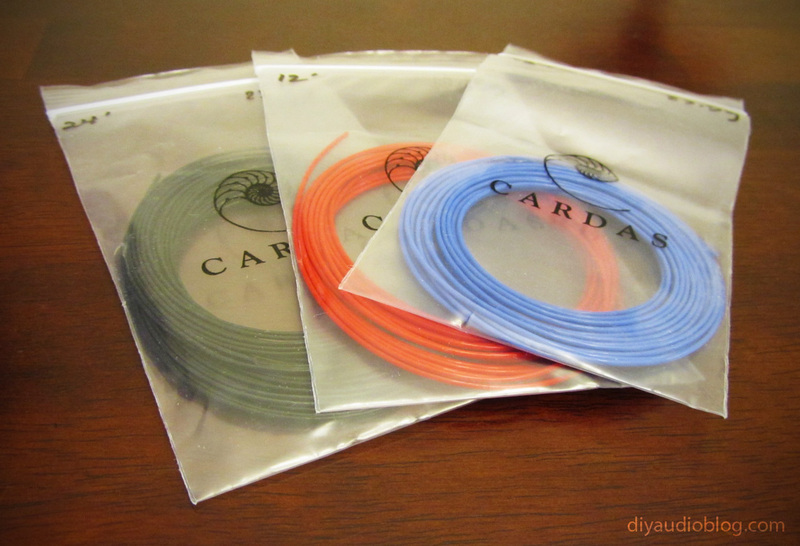 Included in the kit is some nice high quality silver plated copper in Teflon wire which is used for internal hookup from the. 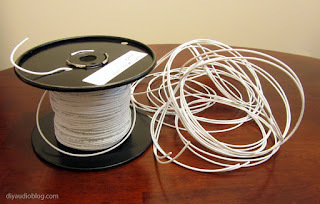 This wire is used to wire up the ground connections (which short to the chassis) and the power transformer. 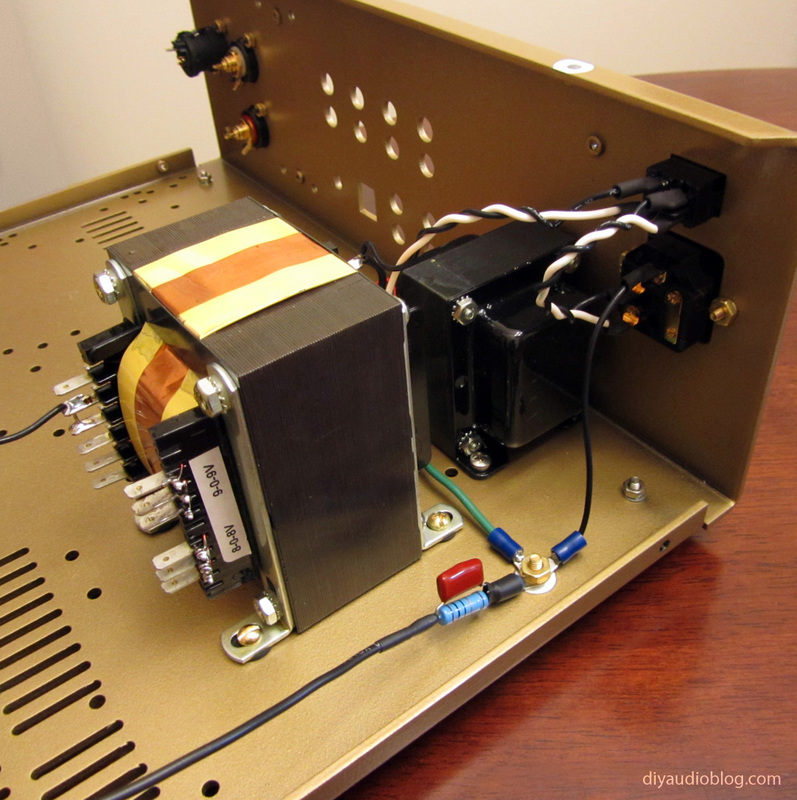 Also mounted during this process is the power choke which takes the place of a resistor to help smooth ripple in the power supply. The printed circuit boards are thick and of good quality, which is useful if one ever decides to change / upgrade parts later on; there's nothing worse than desoldering parts on a cheap PCB and losing a solder eyelet in the process. 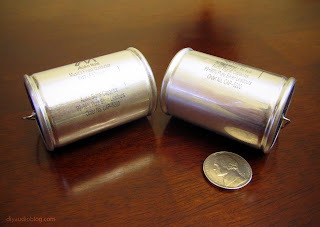 It's also nice that the real estate given for coupling capacitors is very ample, so the builder can easily fit some big paper-in-oil caps if they'd like. 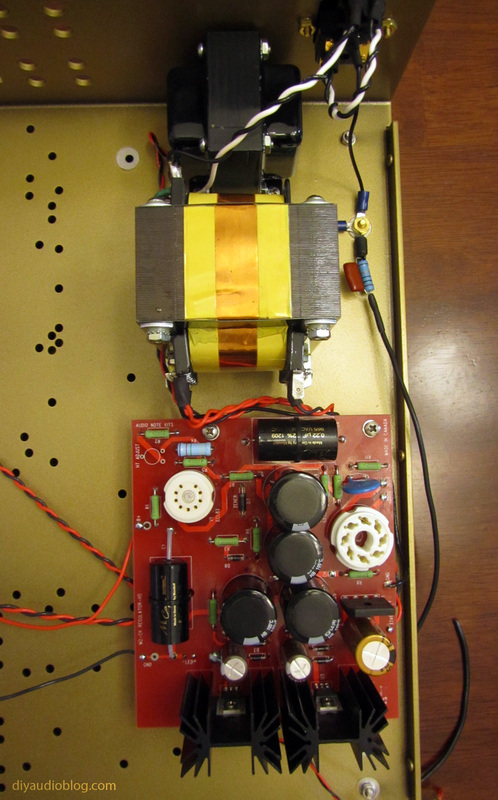 Also note the little holes in the board near the capacitor area so they can be secured with zip ties. Zip ties are not included with the kit but are readily available from hardware stores or places like Partsexpress. The DAC 2.1 is offered with Mundorf Supreme film capacitors but you can request the Audio Note Tin caps for the line board. Below are the Audio Note tin caps shown next to a nickel for scale. These are not small by any means, but typically sized for oil caps. These are not paper in oil but make use of mylar film and are assembled by Audio Note UK. I decided to begin the build by populating the boards. 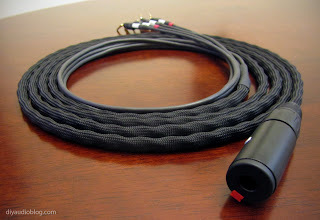 Brian Smith of Audio Note Kits was able to offer me some nice Takman carbon film resistors for the line board. You'll also notice the AN tin caps and Elna Silmic II electrolytic capacitors. Interestingly, the ceramic tube sockets here are the chassis mounted type which are mounted on aluminum standoffs. The reason for this is so wires can be soldered to eyelets at the bottom of the socket to power the heaters on the tubes. 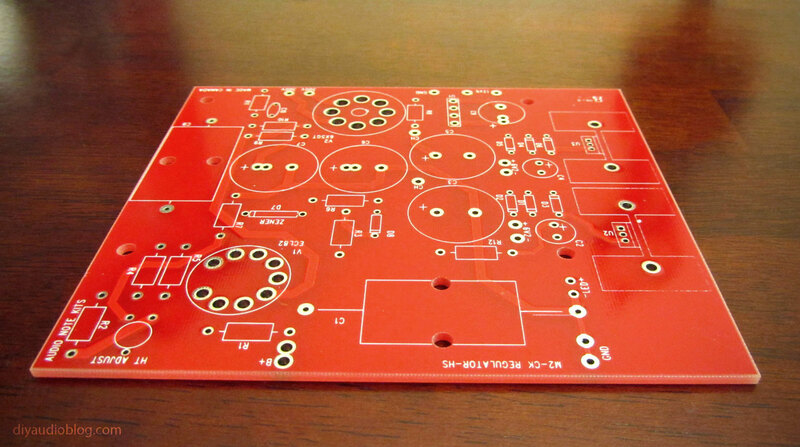 Next the M2 power board would be populated. 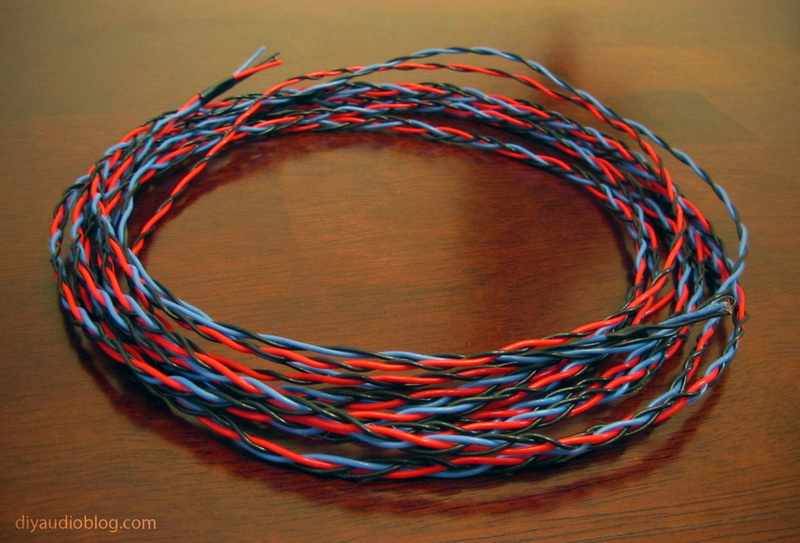 I dropped a few parts that I had in storage in these, including Kiwame resistors which are rated to 2 watts and typically measure very close to the printed value. Also added were Elna Silmic and Nichicon Fine Gold capacitors. 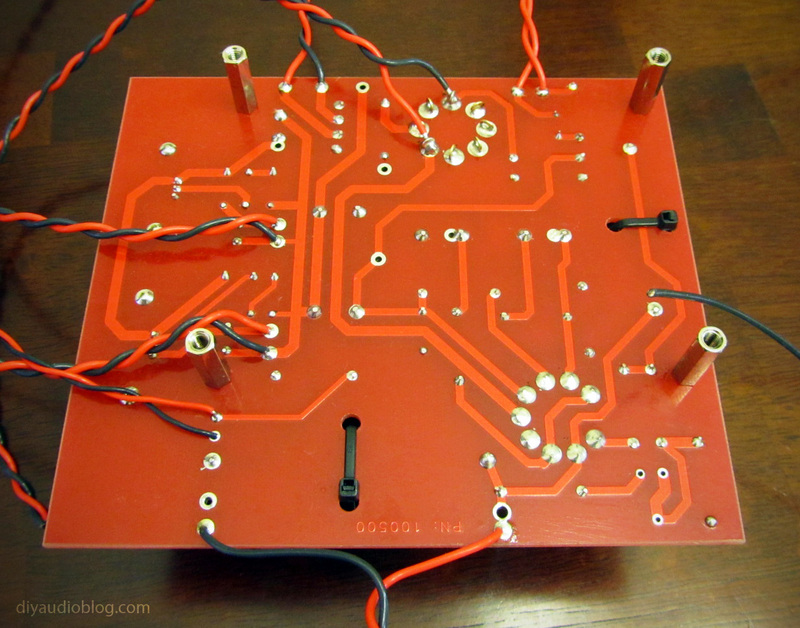 Once the boards are completely populated, it's a good idea to clean off the solder flux. My favorite way to do this is to splash some isopropyl alcohol on a cheap toothbrush, in this case a Snoopy themed kids toothbrush (they're like a dollar for a four pack) and scrub away on the bottom of the board, then dab with a paper towel to remove the flux. After doing this 2-3 times the board is suitably clean. Once the boards are clean, they are wired up to the unit. As the M2 Power Board has quite a few wires connected to the bottom of the PCB, fly leads are all soldered in place before the standoffs are secured to the chassis. Below is the top-down view of the unit after the fly-leads from the power board were soldered to the transformer. 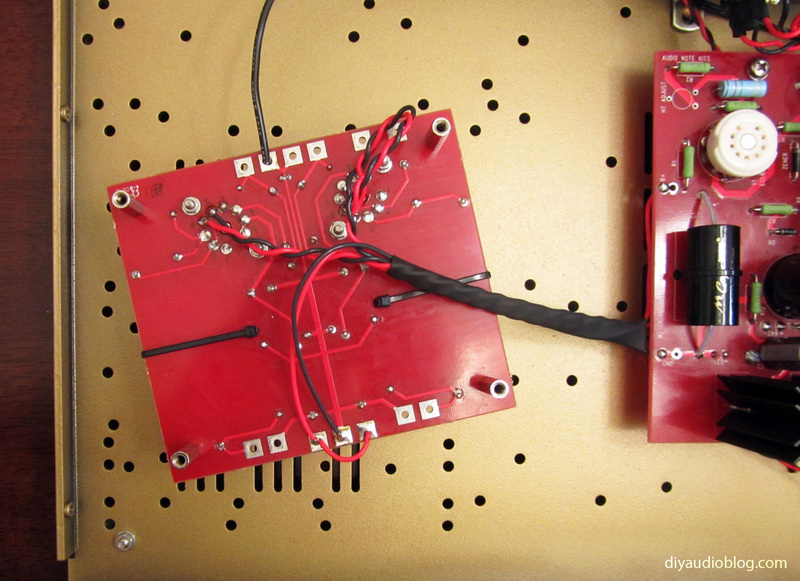 Once the M2 Power Board is secured, the line board can be wired up. As shown in photos of the internals of the unit, heatshrink was placed on the leads travelling to the line board for a more uncluttered look. 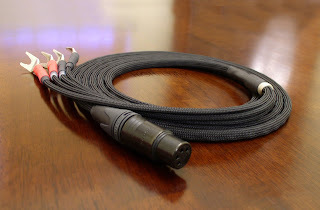 I'll be showing off a rather unique audio cable today: a cable that connects the outputs from a speaker amplifier to a pair of headphones. 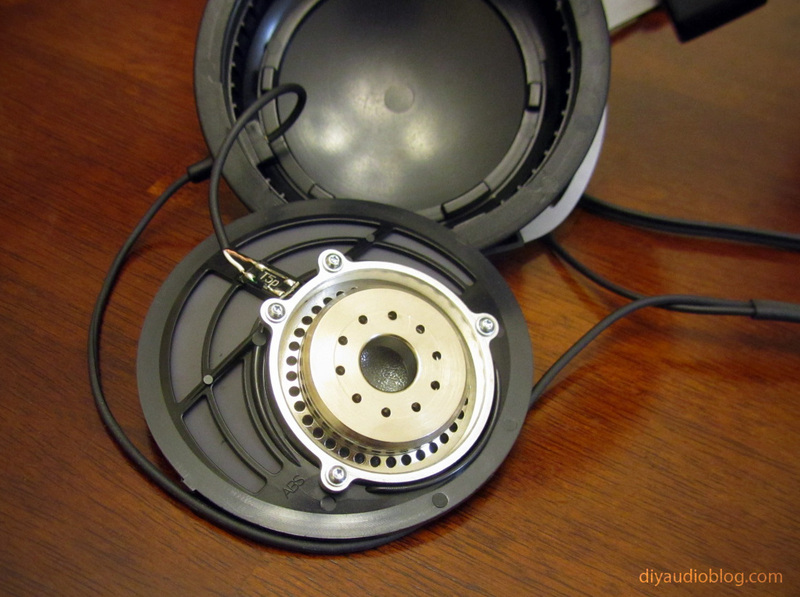 You may be wondering why someone would be using a speaker amp for a pair of headphones. 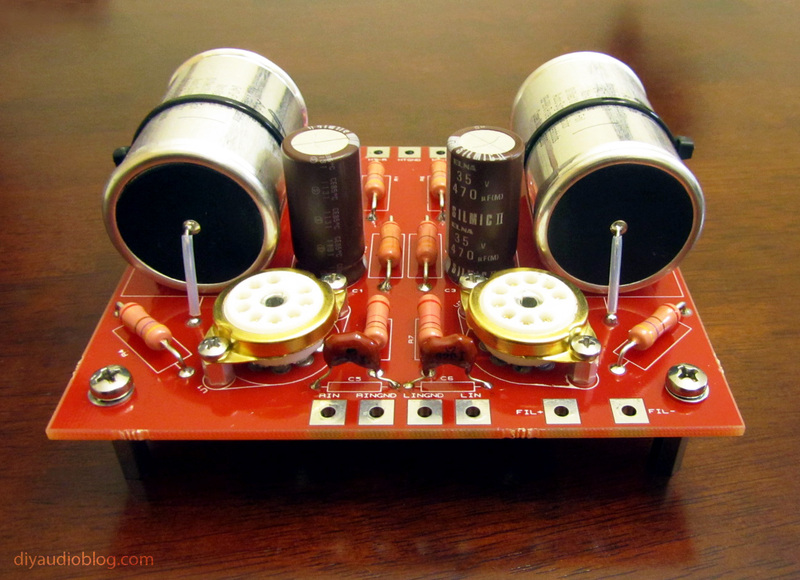 A typical headphone amplifier will output relatively a small amount of power compared to the speaker amplifiers (in small fractions of a watt measured in milliwatts). 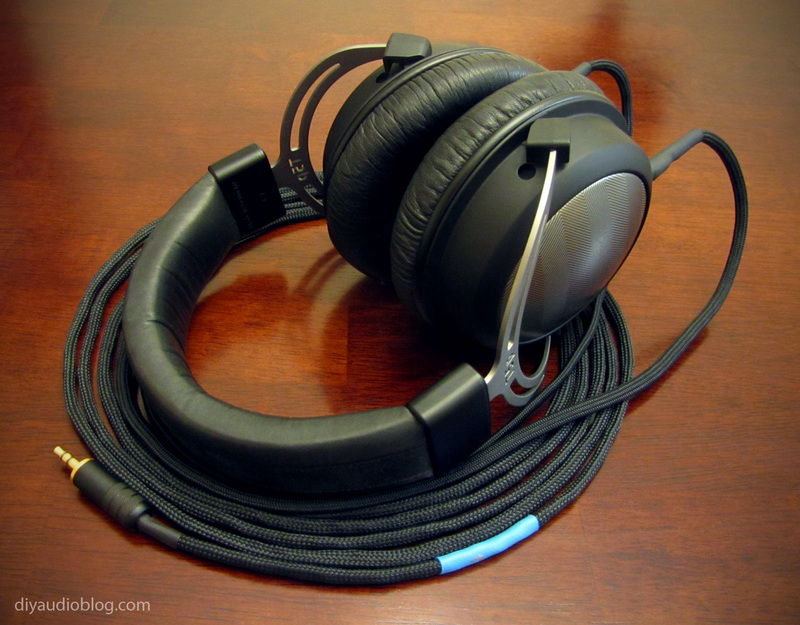 The Audeze, as well as certain other planar magnetic headphones like the HiFiMan, really benefit from some added wattage to sound their best as they aren't the most sensitive drivers. Hense, in some cases using speaker amplifier can be worthwhile. Obviously speaker amps were made with speakers in mind, so there will be compromises involved. 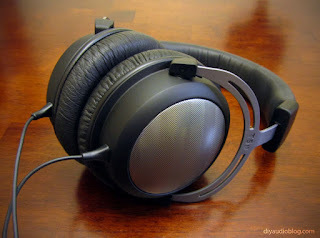 First and foremost, one can blow out or damage sensitive headphone drivers if turning up the amplifier volume too high. 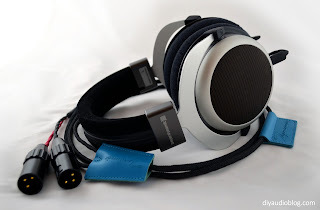 There are also some impedance differences, typically a speaker amplifier outputs at 8 ohms (and in some cases 4 or 16) while headphones will typically range from 35 to 600 ohms. Another factor to consider is that speaker amplifiers may not have a quiet black "background" when used with headphones due to noise, magnetic flux from the transformers or other reasons. 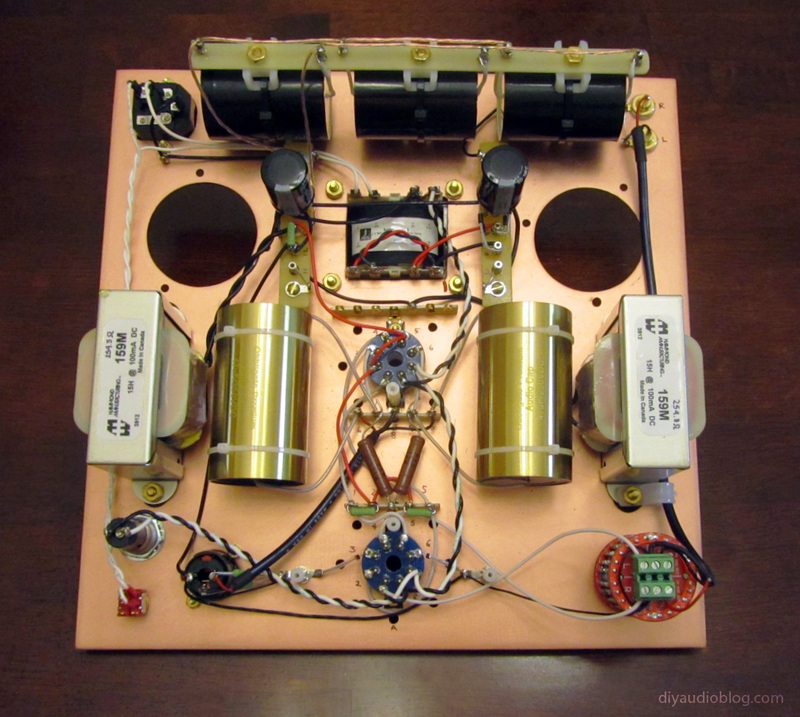 Even still, with all of these factors, many audio enthusiasts still prefer listening through their speaker amp. I'm starting out with some thicker-than-typical wire to braid. 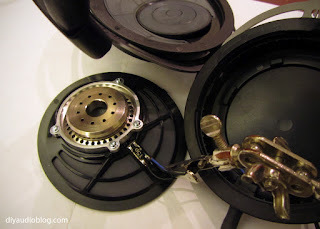 Using thicker wire not only assists in delivering a little more juice to the headphones but makes the soldered (or screwed in some cases) connection to the spades or bananas at the speaker amp end of the cable stronger. With a thin 24 gauge wire that would typically be used as a headphone cable, the joint would not be able to take as much abuse as a thicker, heavier wire. 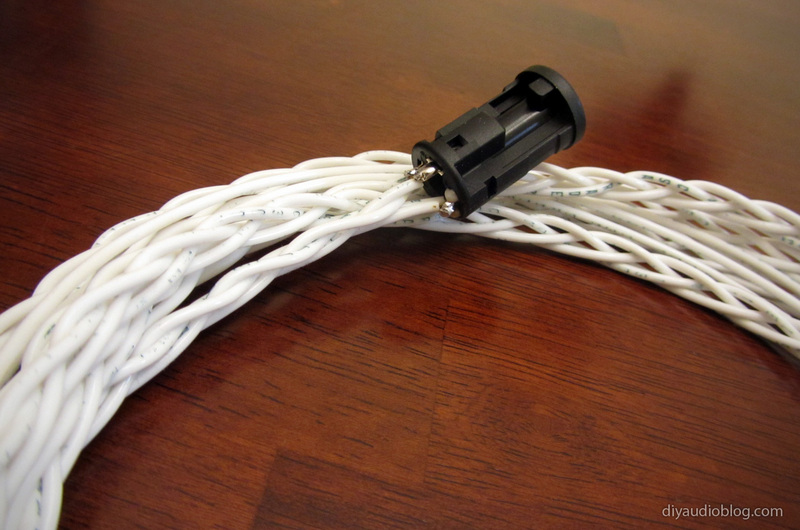 This wire is braided and an unbalanced Neutrik locking female is soldered in place. 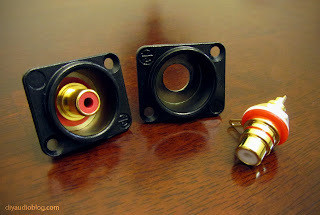 Note that an unbalanced connector is okay for use as the speaker amp has shared grounds (the left and right ground are connected with no resistance), otherwise this would not be acceptable and a balanced connector would be required. Note below that the two ground connectors are soldered together to the ground pin. The cable is now sleeved with the typical Techflex brand Nylon Multifilament in the 1/4" size and heatshrink is applied at both ends. 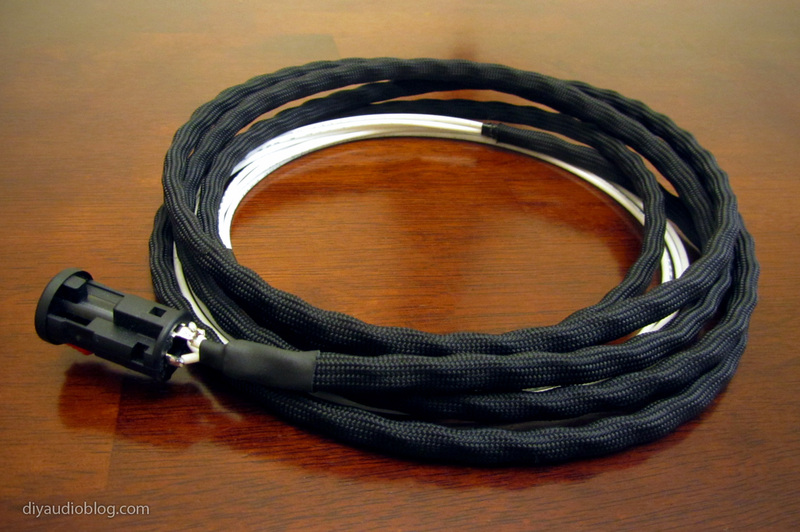 I think it's visually appearing how the cable geometry is fully visible thanks to the tightness of the sleeving. 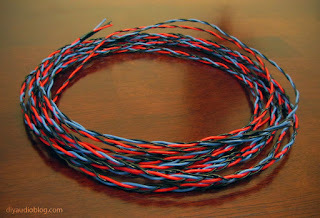 The four lengths of wire are left unbraided at the end for the amp-side connections (sometimes the binding posts can be spaced relatively far apart). 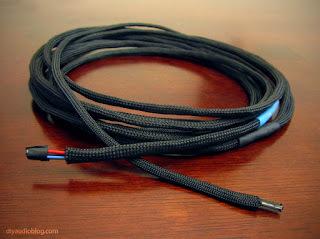 The white wire was then covered with thin black heatshrink to match the color of the rest of the cable. Note that the heatshrink, just like Teflon tubing, can be resistant over long distances and can require a bit of patience. Once in place, a heat gun is used to shrink it down by starting at one end and moving to the other to avoid air bubbles getting trapped in the middle. Now the spades could be soldered on. These particular spades are made by LOK and available at Homegrown Audio. They're gold plated and feature a high copper content (over 68%) and fit a 1/4" or 3/8" binding post. Each connector is labelled "L" for left, "R" for right and "G" for ground. 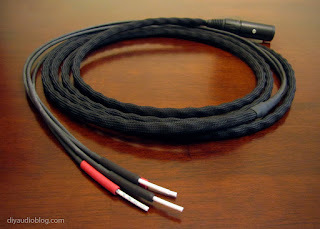 And here is an example of the same type of cable for balanced operation. 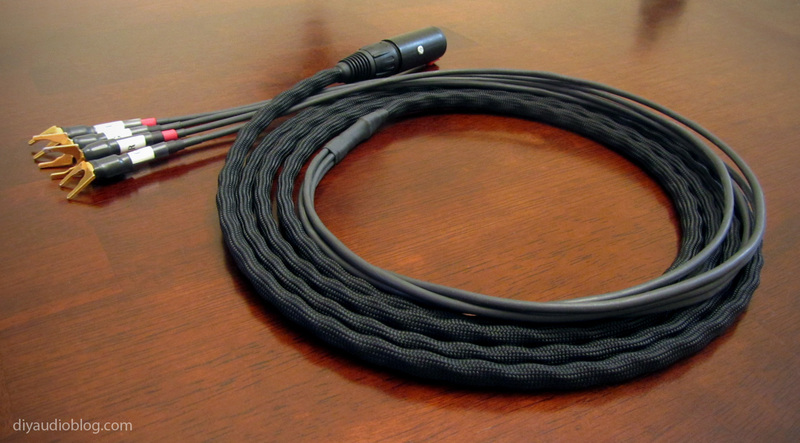 this particular cable uses a Neutrik locking female and rhodium plated spades. 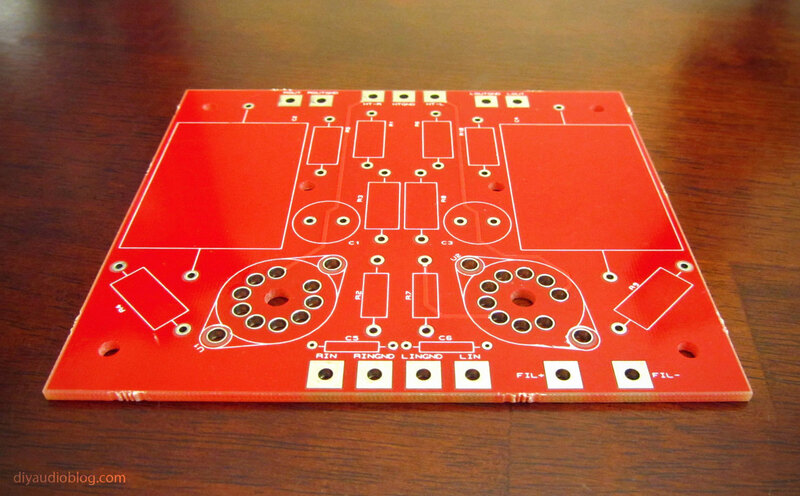 Need one and don't want to mess with a soldering iron? Zynsonix offers custom-made speaker amp to headphone cables (and many others), please contact them for a quote.